Q. Where can I find help deciding on the tone/theme of a particular story? A valuable resource for finding the tone/theme of a story is the database Literature Resource Center. To access the list of databases, go to the LRC homepage and click on Databases. You will see a list of databases. Scroll down to Literature Resource Center and select it. If you are off campus, you will need to put in a username and a password. Your username is your 7-digit TCL ID. Your password is the first initial of your first name followed by the last three digits of your social security number. For best results, you may want to use the Advanced Search function, located at the top of the page. In the first row, select “keyword” and type “theme” in the box. 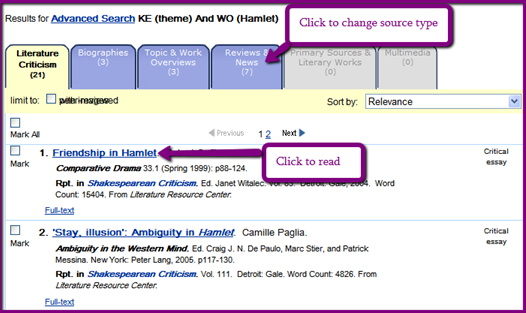 In the second row, select “name of work” and type in the title of the story (example “Hamlet”). Click "Search." The results will be grouped by source type. For example, the literary criticisms will be grouped together, the biographies together, etc. Click on a resource in the list to read it or click on one of the blue-hilighted tabs at the top of the page to see other source results.